Générations cirque was born at the end of year 2016 from the desire to deploy into a place where circus doesn't go much. 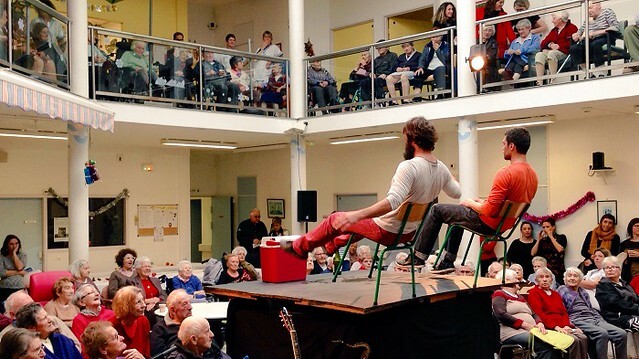 A dozen of artists settled in Tréguier Hospital to meet the inhabitants and the health-care students to explore the diversity of those life paths and experiences. The quality of the exchanges between generations made those 9 weeks of residence a very special and fruitful time of which des Figures tries to catch the snapshots. From the first weeks, the stereotypes usually related to aged people exploded and we found in the inhabitants as well as in the students a mad energy, a strong will and a boundless enthousiasm. 6 month to take time to meet each other, to create a real relationship and to share precious moments with the inhabitants of the hospital around creative workshops. It's a special time during which everyone can express himself, underline his creativity and during which everyone develops his self-esteem by considerating the other with kindness and goodwill. 6 month of thinking and support of health-care students at the IFAS. Circus practice has been a perfect opportunity to work on team-building, to have a think about the relationship between the nursing staff and the person who is taking care of in their daily interactions ans to explore together the topic of the body relationship in the practice both of the circus artist and the medical staff. 6 month of creation during which the team of artists leaded by Sébastien Wodjan is connecting with the inhabitants, the hospital staff and the students to create ans experiment together by mixing up all kind of life experiences. This collective creation is to be shown in public under our tent in june 2017, in the perspective of an opening of the hospital doors and of a nice sharing with the broader community... an opportunity for everyone to push away some limits ! To find out more, join us on Facebook ! Thank you Des Figures for your graphic and visual work that surrounded the project. To see more videos, drawings and all the records of this experience, visit the dedicated Tumblr.